Apps are a tool: that is their prime role. They can help us communicate, distil a search, log data or entertain us; that basic definition is always the same. As such, the user goes to an app for a specific purpose. They want to get straight to the solution it provides, without being mired in a complex interface. The most popular mobile apps are brazen about their function, and perform it as quickly as possible. Tinder, for instance, which has generated over 9 billion dating matches, tends to load in seconds, scans your location and brings up a massive swipe-able list of fellow users. Music app Shazam, on the other hand, immediately launches the distinctive ‘turntable’ button for identifying a song. Both of these brands are clear about what they represent – convenience, speed, and a single aim that isn’t hard to decipher. Just one core purpose (expressed cleanly with large instigators on the screen) is enough to symbolise your app’s confidence and unique character. In a similar vein, we must remember that digital users are constantly assailed by words, images and graphic delineations. Our screen-time can be overbearing; something that an app must avoid at all costs. We go to these interfaces for a brisk, uncluttered break from pages that are tough to process. The perfect UI, then, shouldn’t be stacked with side bars, reminders or menu screens. If they are there, they have to be unobtrusive. 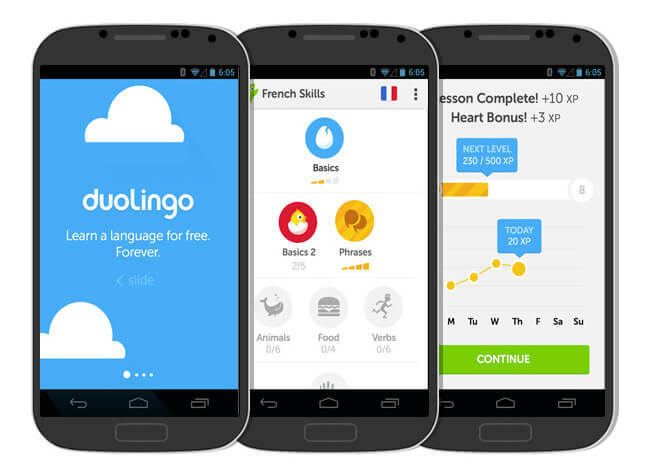 Language app DuoLingo, as one example, presents your skill tree in a single, scrollable format. All the varying categories of the learning experience are shown, but you can pick and choose which you want to follow. The user’s familiarity with a linguistic group is represented in a gold bar, ranging from 1-3: an instant snapshot of their progression, devoid of stats or comparison charts. Quite aside from the digestible qualities of app development, the UI needs to be fun and attractive. Dull, misaligned colours will sap your brand’s energy, whilst a lack of media properties – such as sound effects, scrolling text and animation – won’t make it seem as intuitive. We have to feel like the app is directly responding to us, even when we interact with it in a small way. This should run through all aspects of interface design: highlighted buttons when we confirm something, or a real-time order price in our shopping cart at the top right of the UI, to take just two hypotheticals. In essence, we’re drawn to technology that seems as alive as we are. A responsive framework lets us see our decisions on the app, realised and implemented as we’re making them.